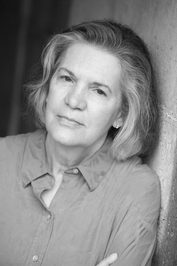 (Helen) Diane Glancy is a Cherokee poet, author and playwright. Glancy was born in 1941 in Kansas City, Missouri. She received her Bachelor of Arts (English literature) from the University of Missouri in 1964, then later continued her education at the University of Central Oklahoma, earning her a Masters degree in English in 1983. In 1988, she received her Master of Fine Arts from the University of Iowa. Glancy is an English professor and began teaching in 1989 at Macalester College in St. Paul, Minnesota, teaching Native American literature and creative writing courses. Glancy's literary works have been recognized and highlighted at Michigan State University in their Michigan Writers Series. lift spine onto my thighs. I put on my rib and collarbone. hear the waxwing's yellow cry. I almost know what it is to be seen. My throat enlarges from anger. I make a hand to hold my pain. My heart a hole the size of the sun's eclipse. as though from a kerosene lamp in a cabin. a shawl over my shoulders. My threads knotted and scissors gleaming. Now I know I am seen. dance and chant in the sun's new light. Is this you? Let us know. If not, help out and invite Diane to Goodreads.